1.Rare presentation of proximal humerus fracture dislocation in a very young child? 2.Treatment strategy for managing such case in acute settings? Introduction: Though proximal humeral physeal injuries are common in children, reports of proximal humeral physeal injuries with disruption of glenohumeral joint are exceedingly rare. We here report such a case. 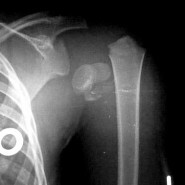 Case Report: A three year old male patient presented to us with proximal humeral physeal separation along with glenohumeral dislocation. Under general anaesthesia, closed reduction could be achieved. Thereafter, three Kirschner wires were used to fix the physeal injury. Wires were removed at six weeks and physiotherapy was started. Good range of motion was achieved, and follow up radiographs demonstrated no evidence of growth arrest at one year. Conclusion: In spite of significant displacement in cases of proximal humeral physeal injury with glenohumeral dislocation in children, closed reduction can be achieved and should be attempted. It is very rare to encounter an injury causing both glenohumeral dislocation and proximal humeral bony disruption in paediatric age group. Although few cases have been reported in adolescent age group, it is exceedingly rare to encounter such an injury in a child below five years of age, with only three previous cases reported in English literature [1, 2, 3]. 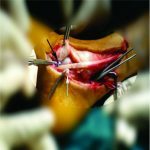 We report a case of traumatic proximal humeral physeal separation with glenohumeral dislocation, treated by closed reduction and Kirschner wire fixation. A three year old boy sustained a road traffic accident and presented to emergency department with pain, swelling of left shoulder and functional inability to use the left upper limb along with multiple grazed abrasions and bruise on the arm. There was no neurovascular deficit or other skeletal injury. Radiograph revealed Physeal separation of proximal humerus physis with dislocation of the proximal humerus epiphysis. In the operating room, under endotracheal general anaesthesia, closed reduction of both the dislocated humerus epiphysis and Physeal separation could be achieved by abduction and minimal traction. This was followed by percutaneous fixation with three smooth pins. Support was provided by a chest arm bandage. Wires were removed at six weeks, and physiotherapy was started. The follow up radiographs taken at six and twelve months showed satisfactory fracture healing. Functional outcome was excellent. At 12 months follow up, flexion of 180 degrees, extension of 70 degrees and adduction of 40 degrees was possible. External rotation and internal rotation measured 90 degrees. Abduction was painful only in terminal 10 degrees and measured 160 degrees, as compared to 170 degrees on opposite side. There was no pin tract infection or any evidence of physeal growth arrest. Incidence of fractures of the proximal humerus in children is 1-2/1000 and comprises 5% of all fractures . Similarly, traumatic glenohumeral dislocation in children is rare, being more common in adolescent, especially athletes . Children less than 10 years of age comprise of only 1.6% of all patients presenting with shoulder dislocation . 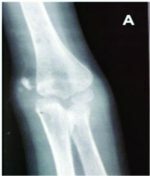 While fracture of the proximal humerus with dislocation of the shoulder joint is occasionally seen in adult, it is exceedingly rare in children less than five years of age. The joint capsule of glenohumeral joint tightly holds on to the epiphysis, causing physeal separation at proximal humerus more frequently than glenohumeral dislocation. Out of the reported cases in English literature till date, Nicastro et al have reported successful treatment of subcoracoid dislocation and separation of proximal humeral physis by open reduction and single smooth pin fixation. The authors have quoted the possibility of fracture fragment penetrating through joint capsule, necessitating open reduction . In another case, a 3 year old child sustained a proximal humerus Salter type 1 physeal separation fracture with glenohumeral dislocation, which was also treated by open reduction and internal fixation . One single other author has previously published a report of successful closed reduction and internal fixation for fracture dislocation of glenohumeral joint in a 2 year old child . In this case, it was probable that there was a partially intact sleeve of periosteum, which had some continuity with the capsule of the glenohumeral joint. It is also likely that the proximal fragment had not penetrated through the glenohumeral joint capsule. Thus traction and abduction could facilitate closed reduction and wire fixation. Hence, to the best of our knowledge, this is only the fourth report of fracture dislocation of glenohumeral joint in children less than 5 years old, and only second where closed reduction and internal fixation was successful in this injury pattern. Fracture dislocation of glenohumeral joint is rare in children less than 5 year old. In spite of significant displacement, closed reduction and internal fixation can give good results and should be attempted. 1. Nicastro JF, Adair DM. 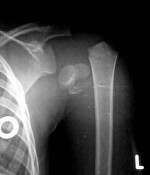 Fracture-dislocation of the shoulder in a 32-month-old child: J Pediatr Orthop 1982;2(4):427-9. 6. Rowe CR: Prognosis in dislocations of the shoulder. J Bone Joint Surg 1956; 38A:957-77.